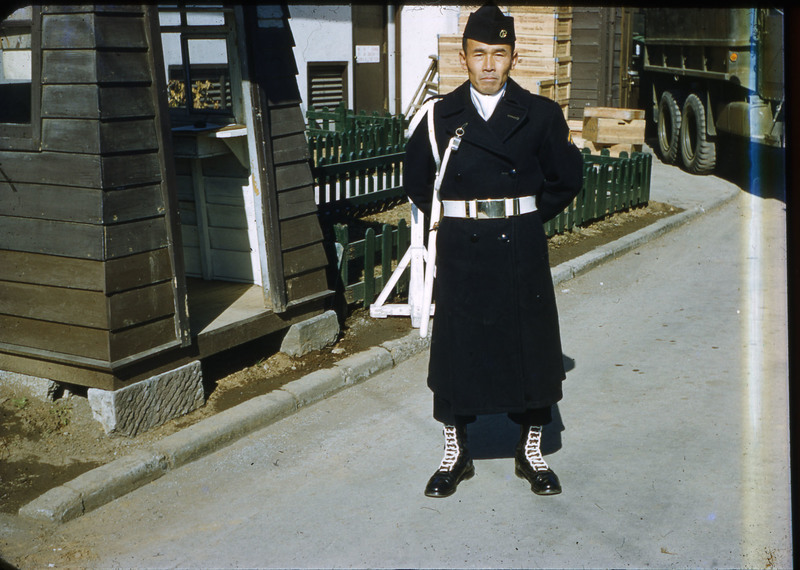 A member of the Japan Self Defense Force stands at ease in the middle of the street. 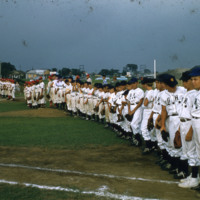 Teams from U.S. military base schools line up after a game. 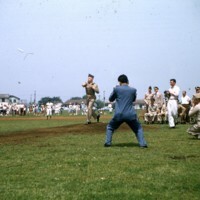 Uniformed military play in a baseball game. 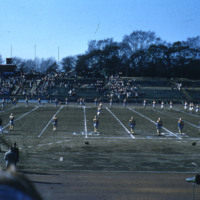 A football team in uniform are spread across a football field before the game starts. 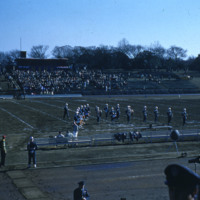 A marching band performs on a football field with a "Navy" sign in the background. 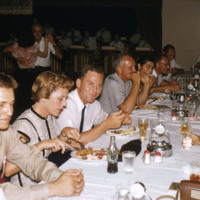 A group of people, mostly men, at a long table during a formal dinner. A band plays in the background under a US Army Transportation Corps sign. 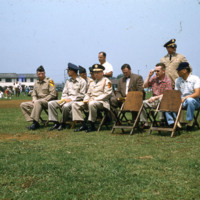 A group of uniformed men, including some members of the United States 1st Cavalry Division, are seated in wooden folding chairs outdoors. 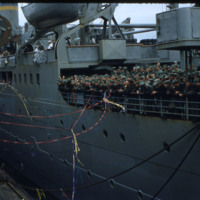 A crowd of sailors stand on the deck of a large ship. Flamboyantly colorful streamers stretch from shore to ship as the ship prepares to embark. 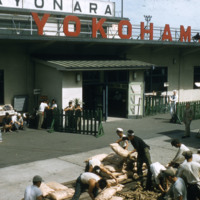 The signs "Sayonara Yokohama", "embarkation booth", and "passports processed here" indicates that this is likely the US Army Transit Terminal at Yokohama. 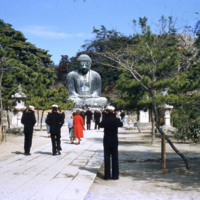 A group of men in United States Navy uniforms mill around in front of the great Buddha statue at Kamakura. 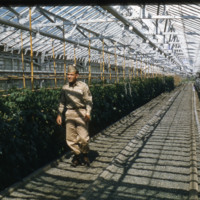 A man in a military uniform casually walks around inside a large greenhouse. (2) In order to accomplish the aim of the preceding paragraph, land, sea, and air forces, as well as other war potential, will never be maintained. The right of belligerency of the state (right to wage war) will not be recognized. Because of this article in the constitution, Japan had only the U.S. occupation forces and a minor domestic police force on which to rely for security after the war ended in 1945. The Japan Self Defense Force, or the JSDF, was formed in 1954 due to rising Cold War tensions and the Korean War. There are three branches to the JSDF: the Japan Ground Self Defense Force (Army); the Japan Maritime Self Defense Force (Navy); and the Japan Air Self Defense Force (Air Force). In the years after World War Two (1939-1945), Japan's relations with the United States were placed on an equal footing beginning with the end of the occupation by the Allied forces in April 1952. This equality, the legal basis of which was decided in a peace treaty signed by forty-eight Allied nations and Japan, was initially largely nominal. Under the terms of that treaty, the Treaty of Mutual Cooperation and Security, United States forces stationed in Japan were to deal with external aggression against Japan while Japanese forces, the JSDF, would deal with internal threats and natural disasters. After World War Two, the Japanese worked to recover stability within their country. Self-confidence grew as the country applied its resources and organizational skill to regaining economic health. This situation gave rise to a desire for greater independence from the influence of the United States. During the 1950s and 1960s, this feeling was especially evident in the Japanese attitude toward United States military bases. The Japan Self-Defense Forces are controlled by the Ministry of Defense. In recent years they have been engaged in international peacekeeping operations, including UN peacekeeping missions. In 2015, the Diet enacted legislation that allowed the JSDF to defend allies, as well. Recent tensions, particularly with North Korea, have reignited the debate over the status of the JSDF and its relation to Japanese society. The Clash: US-Japanese Relations Throughout History by Walter LaFeber, W W Norton & Co Inc; New York, 1997.